Saving your money and time since 1989. Lease negotiations with a new tenant required installation of a new roof system. Ownership contemplated a holding period of ten years or less. We presented several alternate choices, including very long term solutions with warranties transferable to subsequent owners. Cost control proved to be the deciding factor. We designed a system to minimize expense and maximize performance. The existing built up “cap sheet” roof over a plywood deck was designed with very good slope to the drains. Minimum requirement is one quarter inch in twelve, yet this roof was closer to one and one half in twelve or more. It was designed without a “ridge” line and the entire volume of rain water was directed to the back wall and drain sump pairs located along the base of that wall. While unreinforced maintenance systems are sometimes installed on roofs in otherwise good condition, with the roof at approximately twenty two years in age, we specified polyester reinforced emulsion with acrylic surfacing. The same warranty is available with one or two reinforcement plies. 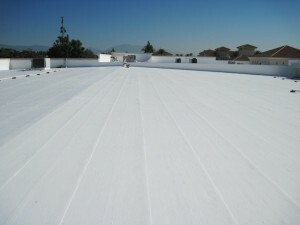 To economize we put additional strength where it was most needed, by specifying one ply polyester in the upper half of the roof, with a second ply around air handling equipment, and two plies across the lower half of the roof. 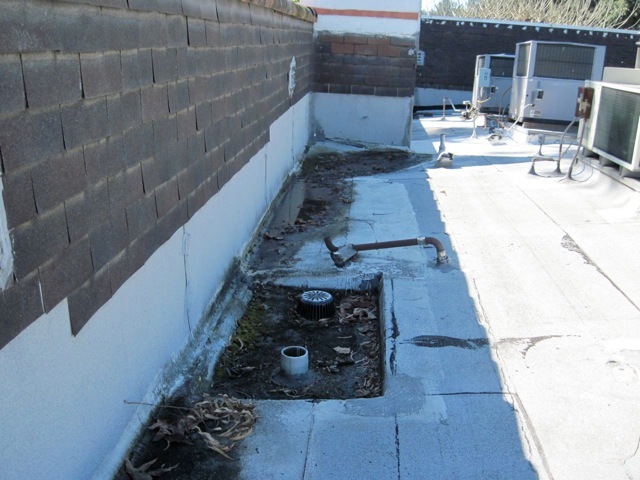 While we did notice some incipient seam separation in the field, most problem and repair areas were located at the waterways, crickets, and drain sumps along the rear wall. We required old roofing at the drain sumps be removed down to the deck, and replaced with polymer modified membranes heat welded in place. This turned out to be the right idea, as during this process concealed sections of water soaked materials were uncovered and removed. 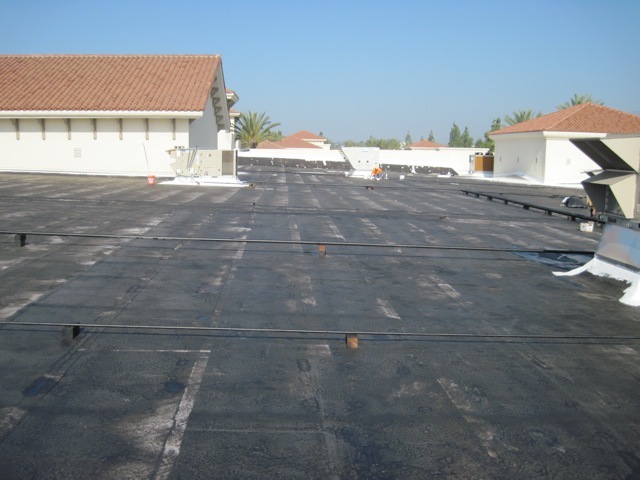 Because the aged elasticity of the oxidized asphalt used in built up roofing is less than one per cent, these materials are subject to cracking and splitting at directional changes in the roofing. 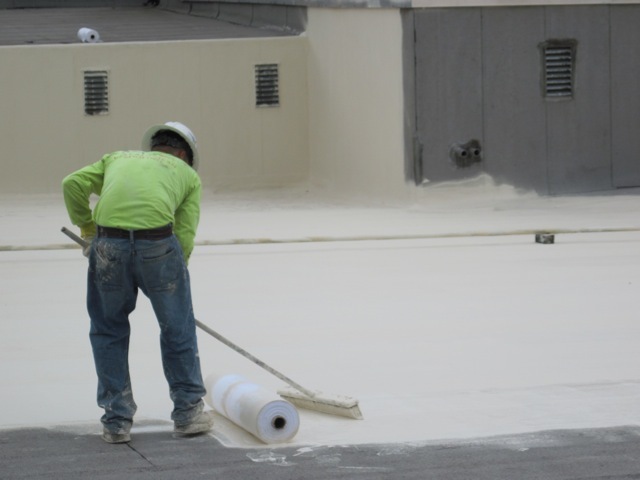 The cold process asphalt emulsion we specified is never heated or oxidized during manufacture, and remains more pliable and flexible. We added an additional two (2) plies of polyester to the drain sumps and waterways bringing the total in those areas to four (4) plies. 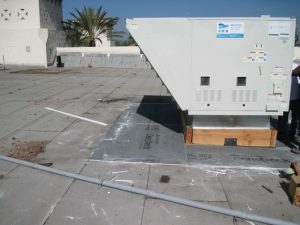 This extra reinforcement significantly strengthens the new roof in the most sensitive and critical areas that receive the bulk of rain water, while adding only marginally to the cost of the system. 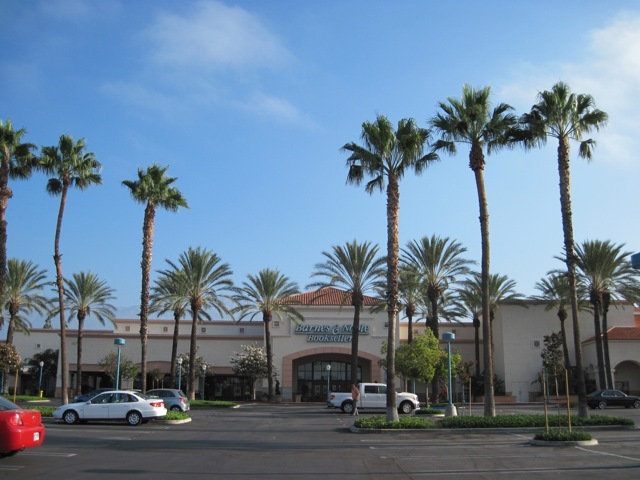 Because one of the new tenants was a food market, additional roof mounted equipment plus a building addition, were added after the Pre-Bid Contractor Job Walk was conducted, Certified Contractor Bids received, awarded, Contract Documents drawn, delivered and signed. Corrections for these alterations were included in a Work Change Order approved separately. Roof reconstruction and replacement in areas where equipment was removed following the Contractor Bid Walk, were addressed in the Change Order. The building addition roof was sealed with two layers of polymer modified asphalt membrane, with emulsion and acrylic surfacing. APP modified membranes were used to seal equipment flashings and drain sumps. We specified gypsum board beneath the modified membranes to level the roof areas removed, and increase fire resistance over the combustible roof deck. Drains sump areas were removed down to the deck, new modified membranes installed, then sealed with asphalt emulsion, polyester reinforcement and acrylic surfacing. An extra ply of polyester reinforcement was installed beneath and above the emulsion in the waterways resulting in four plies in those areas. Any areas with defects or imperfectly sealed reinforcement seams were corrected with a “three course” reinforced acrylic flashing cement method. Prior to correction, areas were marked for identification. Asphalt emulsion and polyester fabric installation completed with correct application quantities. Energy Star® reflective surfacing was applied in two separate cross direction passes to complete the process. Some building owners are surprised to discover their new roof costs less than anticipated. 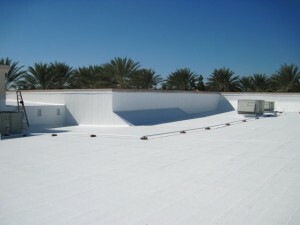 Cold process, fluid applied reinforced roof systems can be eligible for “warranty renewal” or extension, for an additional ten (10) years, at reduced cost. The asphalt emulsion and polyester reinforcement beneath the reflective white surfacing is left unchanged. New white surfacing is reapplied after correcting surface defects. 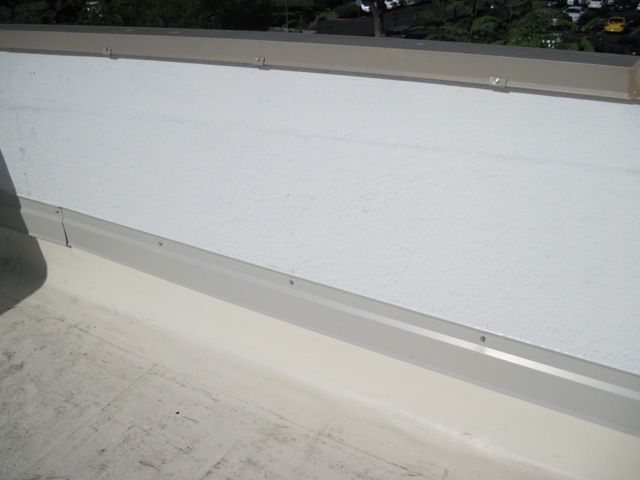 Waterways and drains are reinforced with polyester fabric and acrylic surfacing. 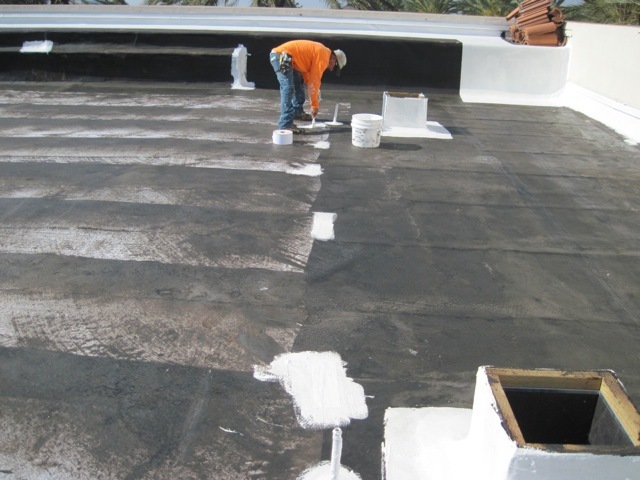 This particular roof has excellent roof slope, good drainage, and two (2) plies of polyester reinforcement fabric set in cold processed asphalt emulsion during the original application, hence it was an ideal candidate for resurfacing. Main low slope roof areas, as well as small lower level front sections were included in the scope of the Work. Loose sections, sump drains, pipe flashings,and waterways were repaired and reinforced with polyester fabric, prior to resurfacing. Roof preparation includes power washing to remove surface contaminants, and provide a clean surface to facilitate proper adhesion of new materials. Drain sumps are considered “waterways.” Polyester reinforcement fabric and acrylic surfacing is extended beneath the clamping rings into the drain bowls. Appropriate protection is used to avoid over spray on to adjoining surfaces, such as this stucco wall. 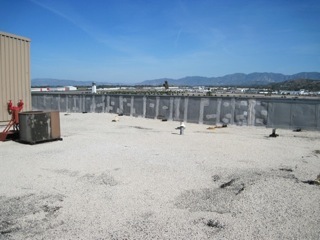 Notice in the distance, the metal coping joints at the wall tops were also reinforced and sealed. 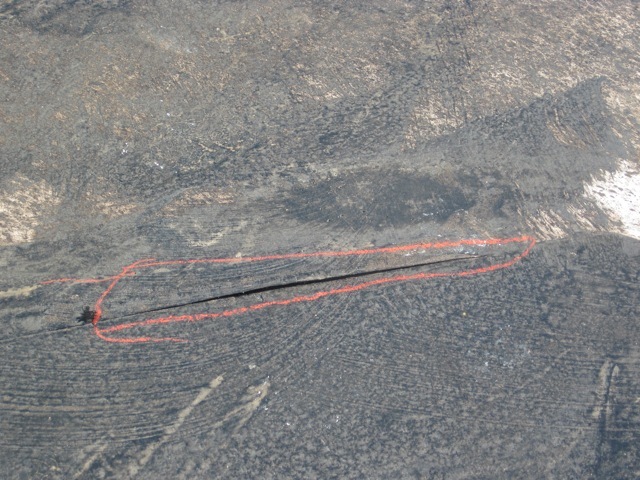 Surfacing is applied in two passes using cross directions for complete coverage. It is essential that correct material quantities are applied. A slightly textured “eggshell” surface appearance should be visible on completion. The building had recently completed a “sale-leaseback” to a major financial institutional tenant. The new owner wanted a minimum maintenance, energy efficient, long term roofing solution. 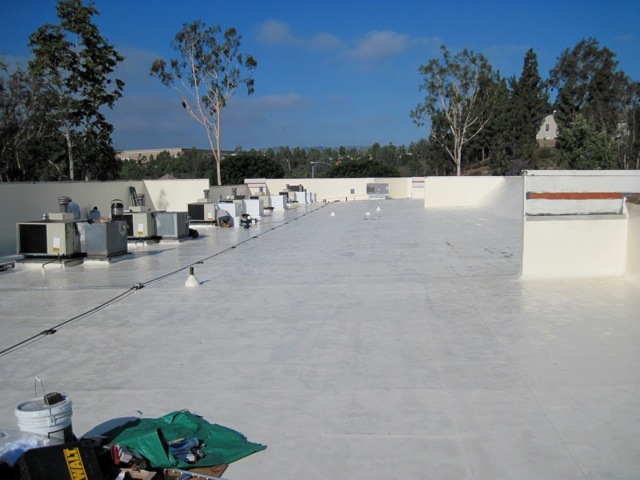 They had budgeted for replacement, and we were able to include a fully adhered new roofing membrane installed directly over the existing emulsion/acrylic surface, including a twenty year full value, no dollar limit, manufacturer backed warranty. 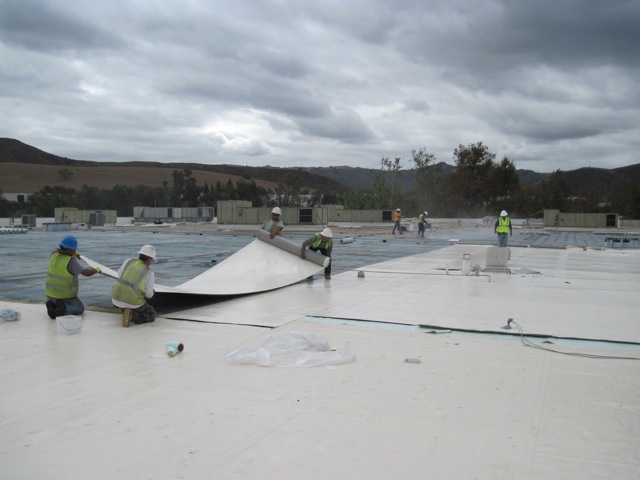 The specified membrane has a successful in service field history of over thirty five years. Original construction dated from 1981, thirty-three (33) years prior. 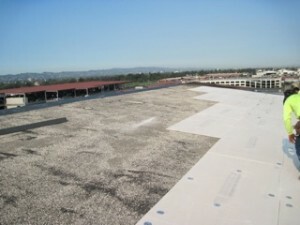 At the twenty year mark in 2001, a cold process emulsion system overlay with a ten (10) year warranty, including one ply of polyester reinforcement and acrylic surfacing, was installed over the existing “built up” cap sheet roof . Now at thirteen (13) years, defects and leaks were present. While the old acrylic surfacing had lifted in “ponding” areas, the polyester fabric installed toward the uppermost portion of the old asphalt emulsion provided a “biting” surface to assist in creating a physical bond, so while the surfacing had weathered and worn, the roofing material Manufacturer approved installation of the new fully adhered membrane directly over the primed, old surface. 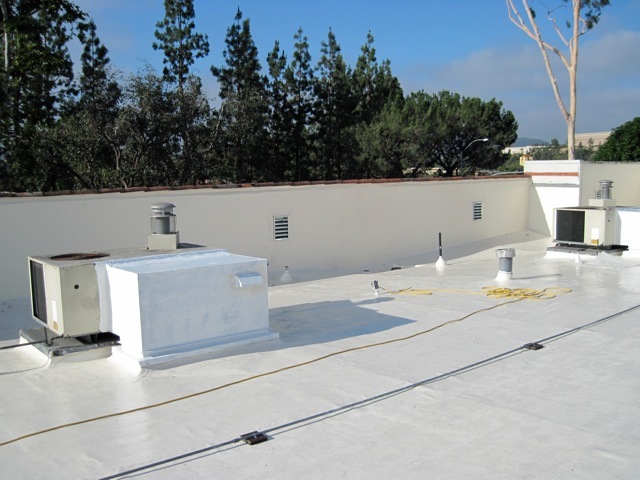 The roof surface was cleaned, then a water based primer applied, to enhance adhesion “tack” strength, and bind residual surface contaminants. 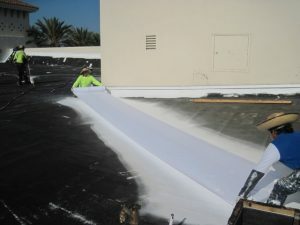 3M CR-20 two component, low rise, adhesive foam was used to adhere the membrane in the “field” or main roof area. A substantial amount of polyester “fleece” is adhered to the back of the membrane. The backing on each roll is destructively tested for adhesion prior to leaving the Manufacturer’s plant. Solvent based adhesive assures complete bonding of the smooth membrane to vertical surfaces, yet was incompatible with water based acrylic surfacing. 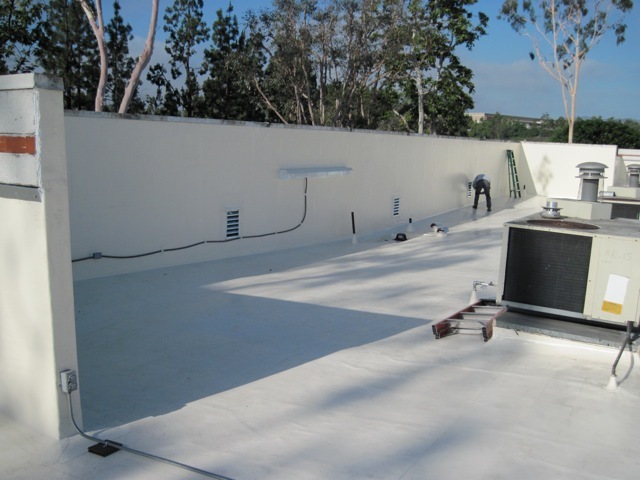 The lower portion of existing roofing on the wall was removed, and new membrane fully adhered to the concrete substrate, with the upper edge receiving butyl tape compression seal behind mechanically fastened metal also incorporating a quarter inch sealant ledge. The original upper level roof was installed over lightweight insulating concrete with a light gauge vented steel deck. Fully adhering the new single ply membrane was the best option for securement. Develop effective and economical “pitch pocket” details. Aggregate surface was vacuumed and defects repaired prior to installation of underlayment. Mechanically fastened cement fiber board (above) on the upper level served as a base for heat welded APP modified membranes. 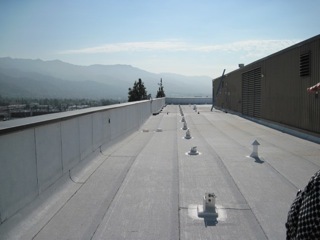 To meet budget constraints, 3/8″ thickness was used on the inaccessible upper level and 1/2″ on the main roof area and parapet walls. Old repairs fastening to the existing walls were ineffective. They simply pulled out of the thin gypsum wall board beneath. Pitch pocket bases received a layer of smooth and granulated modified membrane. 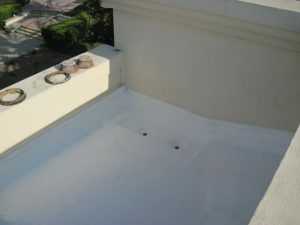 Acrylic flashing cement reinforced with polyester fabric was applied from the penetration extending down over the sides. 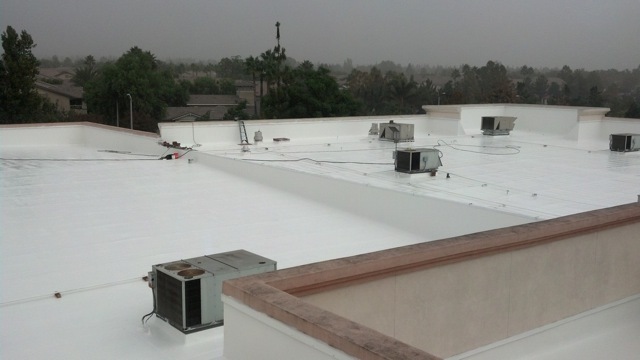 We provided the Owner with seven (7) possible choices to meet their criteria of a twenty (20) year roof system with proven performance, installed by seasoned applicators, while meeting stringent budget requirements. 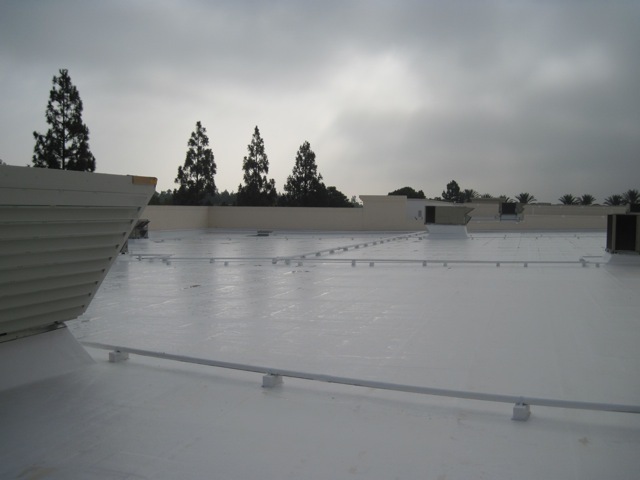 They selected the all acrylic fabric reinforced system applied over the existing single layer three ply built up cap sheet roofing. This roof has a highly reflective white surface which reduces surface and interior building temperatures to save energy and extend weathering life. The other systems that were considered but not chosen, in part due to higher installation cost were: single ply PVC-KEE mechanically fastened with an alternate for fully adhered, a competitive acrylic fluid applied product, four ply asphalt built up roof, and APP polymer modified roof retrofit or with removal of the old roof. Once the selection was made we prepared written Specifications for the installation, screened contractor references, conducted the on site pre-bid job walk and obtained three competitive bids. Following a pre-construction meeting to review the Specifications with the project superintendent, work began and we performed quality control inspections at regular intervals. The system was applied in four (4) stages. 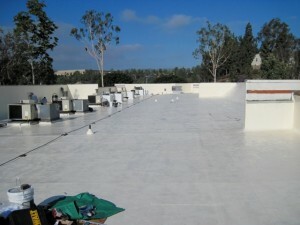 After cleaning and preparation, polyester reinforcement fabric was embedded in four gallons per hundred square feet (aka roofing “square”), followed by three additional applications of finish surfacing. The foundation coat differs from the finish coat is several aspects. Apart from lack of UV (ultraviolet) and dirt release compounds, the foundation coat includes a surface which retains its adhesive tack even when dry to resist ponded water and improve adhesion of the finish layers. 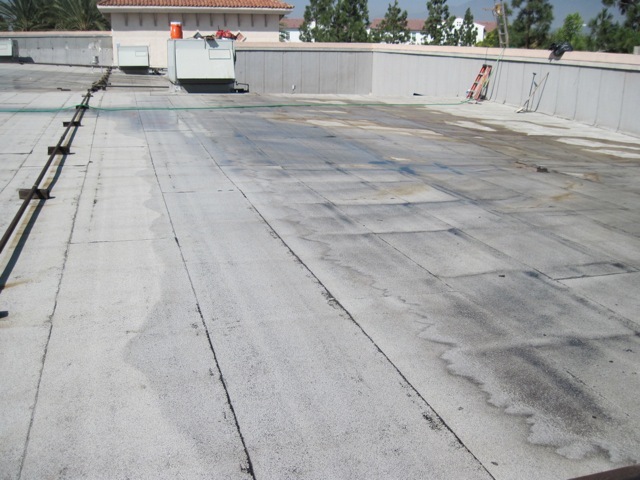 When Santa Ana winds deposited a layer of dirt over this surface, it was cleaned with water and a stiff bristle broom then a new layer of foundation coat applied to re establish the adhesive surface. Here are some photographs which illustrate the progress of the project. 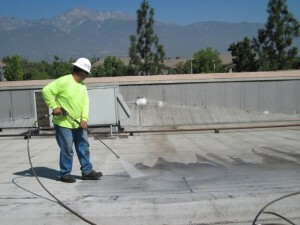 The roof is being power washed to remove surface contaminants. Local ordinances permitted this type of “grey water” discharge though some municipalities differ. Here you can see the clean surface on the left compared with accumulated surface dirt on the right in the process of being cleaned. 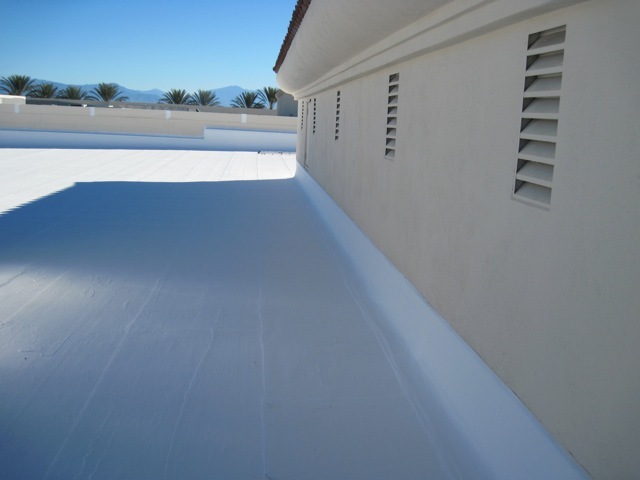 Because all rain water striking the roof surface is directed to drains, the old roofing at the drains was removed, a mechanically fastened base sheet installed, followed by a smooth mid ply APP polyester reinforced modified membrane, and a granular surfaced finish membrane. Look closely and you can see the line where the old roof was removed, as well as the drain pipes from the upper level that empty into these drains. 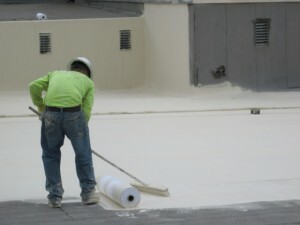 Here one of the workers is “brooming in” the polyester fabric to insure full adhesion with no wrinkles in the foundation coat. 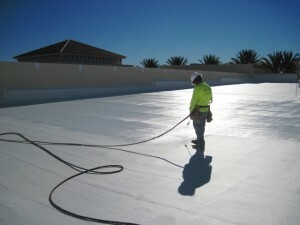 The base coating is applied at four gallons per square with the fabric absorbing three gallons. 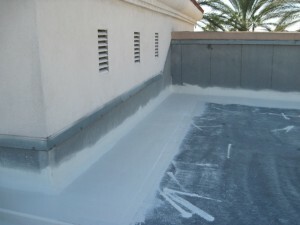 Note the tan color to differentiate from the finish white surface applied later, to help visually confirm full coverage. Some of those side parapet walls are seven (7) to ten (10) feet in height. With this system, polyester fabric was installed over all wall surfaces as well as in the main “field” area of the roof. 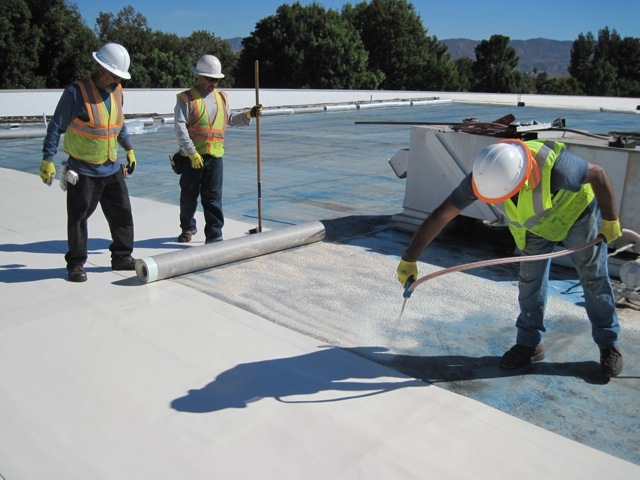 Here you can see the first layer of the roof being applied with the application of acrylic base material, embedding polyester reinforcement fabric, and brooming in for full adhesion with no voids. When this dries, the roof is waterproof. The next three (3) layers protect this foundation layer from the elements over time. A second layer of polyester reinforcement was applied in all waterways at the base of the walls, around drains and extending out to areas that may hold water temporarily in heavy rains, and also an additional layer in front of equipment where service personnel will create foot traffic during maintenance and filter changes. Here is a photograph showing three (3) sections of the completed roof area. There are two adjacent spaces separated by the parapet wall in the center as well as one of the upper level roofs. 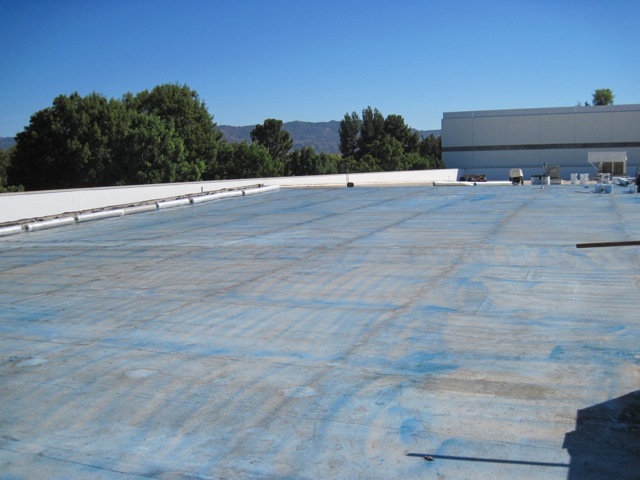 The “before and after” photographs (below) of this fully adhered single ply roof installation solved problems with the original built up hot asphalt roof installed in 1989 at this retail commercial property. This particular center had very good positive slope engineered into the original deck design which undoubtedly contributed to the extended life of the original roof. Some of the parapet walls are angled directly into the sun, so it was important to select a material with strong resistance to ultraviolet degradation. The original parapet walls were covered with standard asphalt shingles. 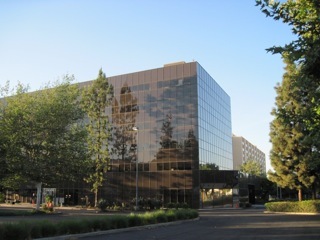 This may have been an appearance enhancement for the original design, but by submitting photographs to the local building department, we were able to show while this could have been a factor during the initial construction, mature landscaping now shielded surrounding homes from a direct view of the roof areas. Once approved, we removed all the existing wall coverings to improve adhesion and facilitate full, secure bonding to the substrate. To mitigate wind uplift potential, in addition to fully adhering the new membrane, we also mechanically fastened the perimeter of the field sheets using termination bar beneath the overlap of the wall coverings at the base of the walls. 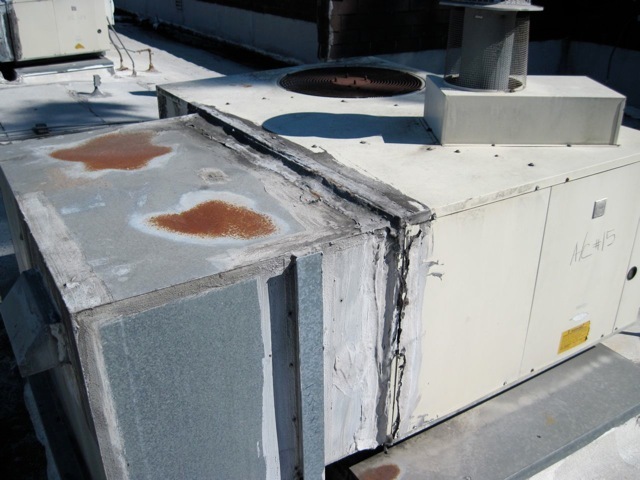 Exterior ductwork delivers air directly into the building with the result that leaks in the ductwork create misnamed “roof” leaks, where even the slightest deficiency in the air plenums, such as a missing sheet metal screw, can generate interior leak complaints. As a result, where old ductwork is present, we require that it be sealed as part of the roofing project. Sheet metal moves with temperature change. 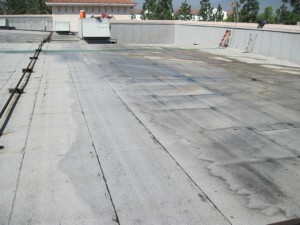 Combined with high heat, this causes standard asphalt roofer’s mastic to dry, crack and split open. We had the Contractor remove all loose or deteriorated sealant and seal all ductwork seams using a three course method with polyester reinforcement encapsulated within layers of premium elastomeric sealant and also replace any loose or missing fasteners. 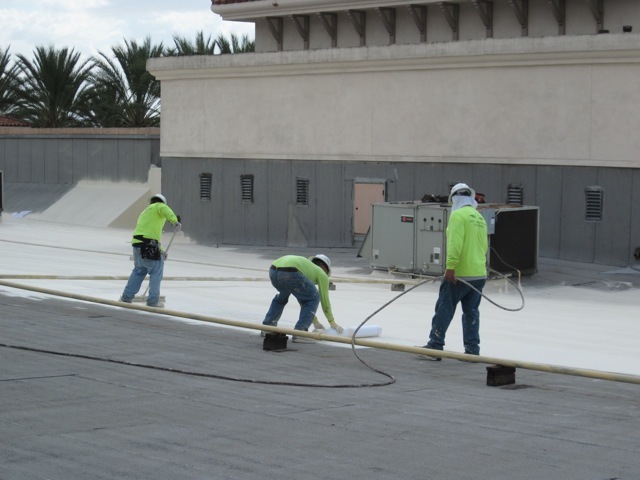 By then coating the ductwork with elastomeric reflective coating designed to seal galvanized steel, thermal movement is reduced, extending the life of the repairs. 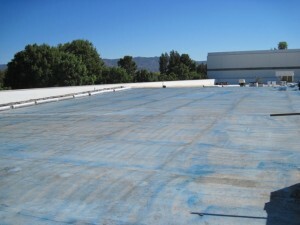 In a retail commercial environment, it is useful to have a membrane that can be repaired throughout its life because new tenants can require different improvements which may require roof penetrations to be sealed. The membrane we selected has the highest concentration of DuPont’s KEE resin which serves as a high molecular weight plasticizer to impart permanent flexibility to PVC which is brittle in its unmodified state. Other lower molecular weight plasticizers “migrate” out of the membrane over time resulting in chalking and loss of mil thickness. The alternate to PVC is TPO which avoids plasticizer use altogether, however it it neither flame resistant nor UV resistant without the addition of chemical modifiers. The fundamental formulations have been “improved” four times in the last ten years. 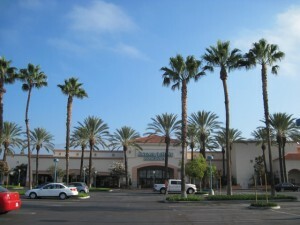 Another concern in a retail commercial environment is puncture resistance of the membrane. 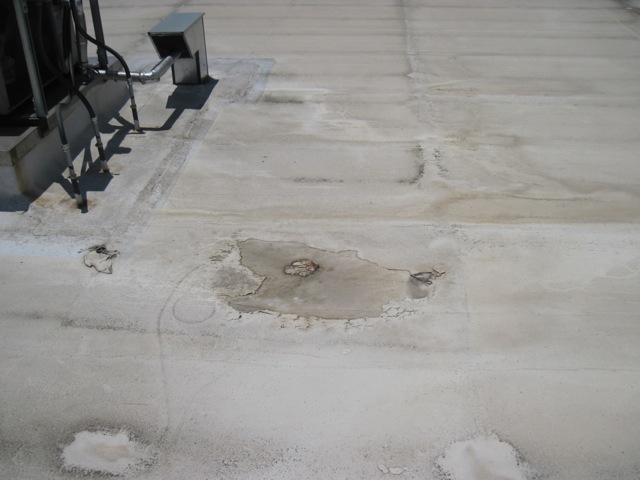 Mechanics servicing air handling units and other roof top workers can leave behind debris which punctures single ply membranes. The tiniest pinhole can allow water to penetrate, however this particular material has the highest puncture resistance of any single ply membrane because the proprietary design of the polyester reinforcement is knitted in their own factory by a company with a sixty year history of designing rugged fabrics for water bladders, waste containment, truck tarps, and tension structures. Most single ply membranes are manufactured by extruding the coating through the polyester core so that it oozes through both sides. With a very dense fabric, this is not possible, so the coatings are fused with heat bonding and adhesive then quality control checked in the lab with a sample from the end of each roll manufactured. The original roof design incorporated “crickets” at small outcroppings along the tall parapet walls to help direct water to the sump drains, but they fell far short allowing significant accumulation of ponding water. We had the roofing Contractor add much larger crickets, extending them to the drains to eliminate the ponding water condition. Because there was such good positive slope in the main area of the roof, raising and extending the crickets allowed us to direct the water efficiently, rather than have it create new ponds at the base of the revised crickets. Being a Southern California air conditioned structure, code provisions of Title 24 “cool roof” requirements applied to the design planning, and the specified membrane meets the heat island reduction prescription in reflection and emittance. Flat Roof Materials Solutions – Need A Flat Roof? – How Do You Decide? 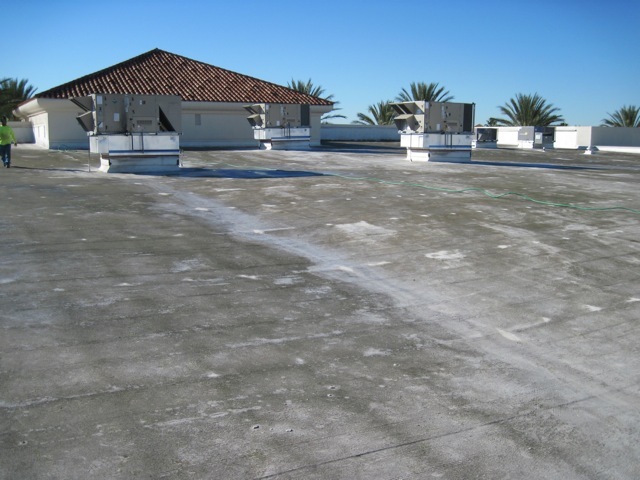 It’s easy to be confused when evaluating roofing material solutions for the flat or low slope roof. By understanding something about the source, benefits and drawbacks of each type of material, you can make a choice better suited to your needs and sift through the often confusing stack of proposals. Manufacturers place their own proprietary names on their roofing materials to promote them. 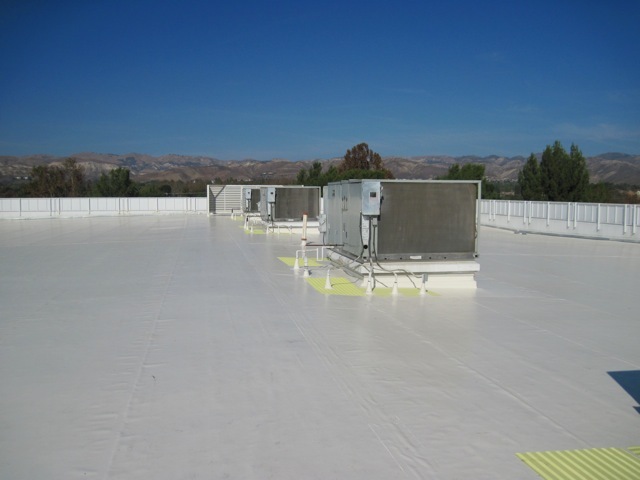 To compare and understand what is being offered, let’s begin with the basic categories of commercial low slope or flat roofing systems. 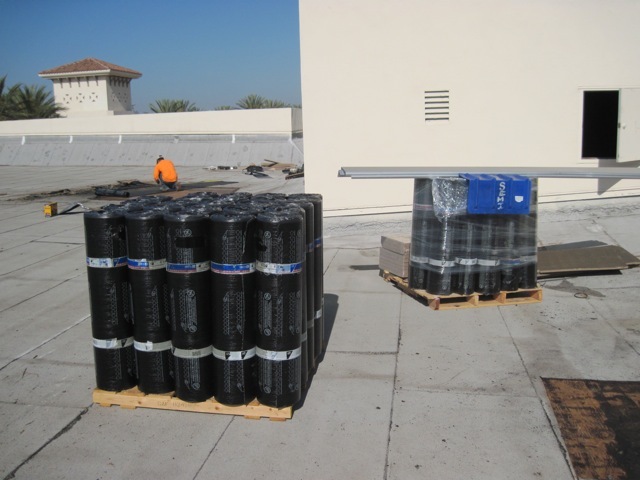 We will look at TPO, PVC, BUR, modified, cold process and EPDM. 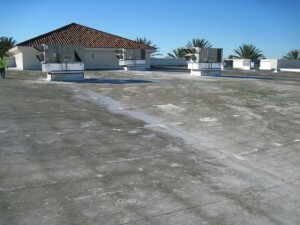 Roofs are actually designed to shed water, so all the rain water striking the roof surface winds up at the drains. This is why it is so important to make sure roof drain screens are clear and allow free flow. Water weighs over eight pounds per gallon, so ponding water can allow weight to accumulate quickly which can lead to subsidence with increasing volumes of water gathering during subsequent rain. Most commercial roof designs include an overflow drain as a safety valve. 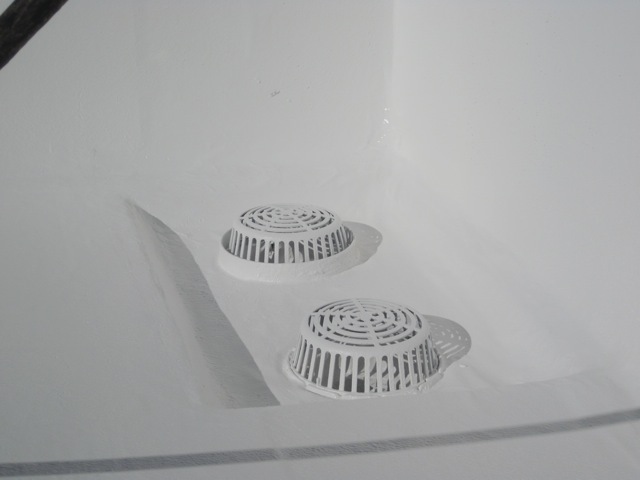 These are often a raised scupper drain outlet, or a second sump drain with a collar surround to prevent the water level from rising above that height. Still, it is best to avoid the height of standing water prior to reaching the over flow. 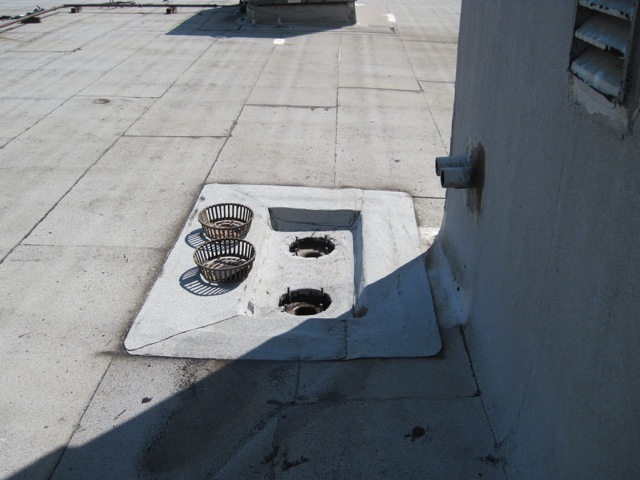 Drains are frequently located in the corner of the roof area and form a natural place for wind blown debris to collect, so be sure to have the roof drains cleared annually as part of routine maintenance, and definitely check the dome strainers for blockage prior to large rain events. 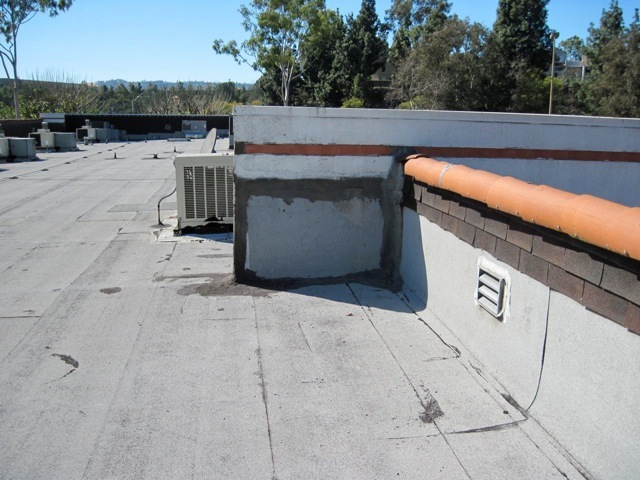 You probably don’t want to think about pipe flashings, and if they are installed properly can be worry free. 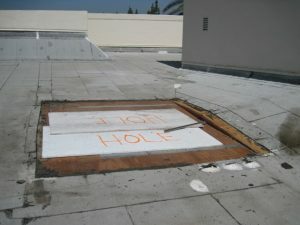 Wherever you have a pipe penetrating the roof deck there is potential for water entry because the opening in the deck forms a direct path to the interior of the building. 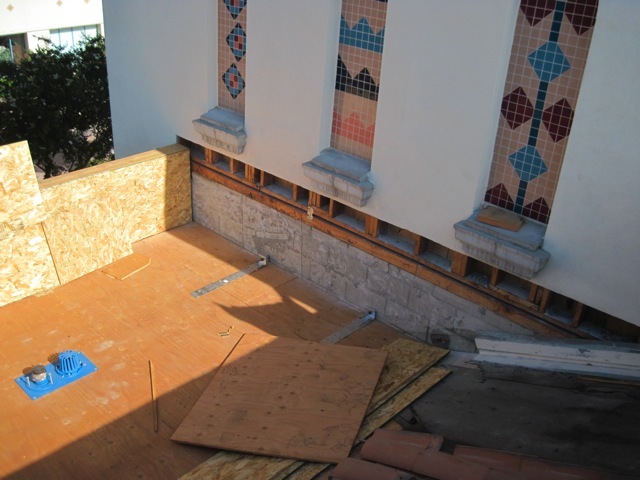 If you have any dynamic deck deflection from wind loading, foot traffic or equipment installations, additional stresses are placed on the flashing and seal. Each different roofing material has different requirements for pipe flashings and there are some alternates within material groups. Cost is often a design consideration and better devices are available at additional cost. For example Chem Curb makes a versatile, excellent urethane based fluid applied sealant poured within a fixed enclosure “the curb” that works well with a variety of systems and is especially useful when pipes are clustered with limited spacing. 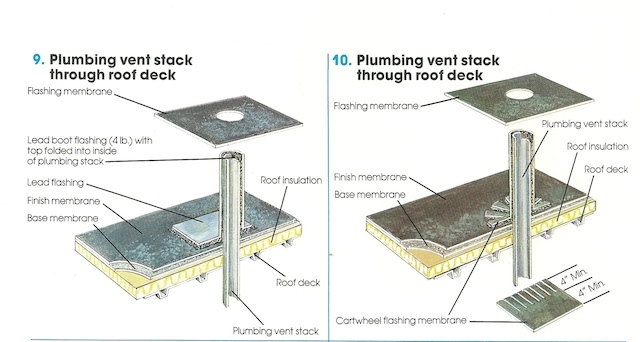 The illustration on the left above shows a lead pipe flashing. These are also very durable installations, albeit at somewhat higher cost. These flashings last because the lead is bent over the upper pipe opening, and the field flashing portion of the lead deforms less that the typical light gauge sheet metal during temperature change. Various other configuration are determined by the material manufacturer. With single ply membranes, pre formed boots are common. They are often cut to size on site, and terminated with compatible sealant and a band clamp. It is helpful to understand the chemistry of the sealants used. Higher polymer content with less filler is always helpful and varies between manufacturers. 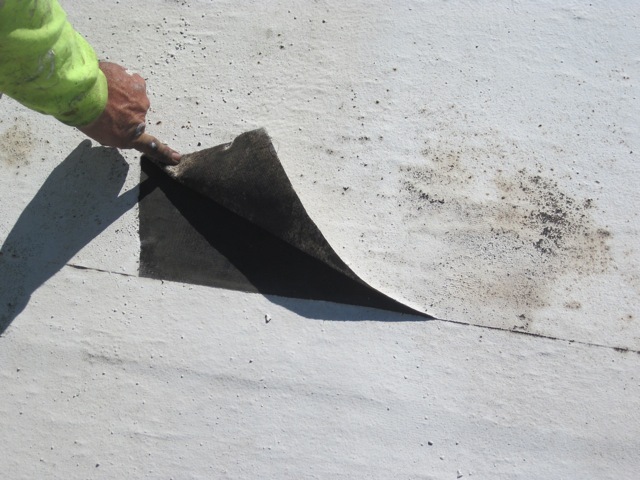 When using asphalt based built up roofing we always recommend polymer modified sealants rather than the standard cut back asphalt mastics. Feel free to call us with your design, specification, quality control or bid and budget questions.